Killam Killam is a thriving and vibrant town located within Flagstaff County, at the intersections of Highways 36 and 13 in east central Alberta. It is a 1.5 hour drive from Edmonton International Airport and a 5 minute drive to the local airport. Killam is an exceptionally clean and quiet municipality with over 1,000 welcoming residents who are committed to their community. 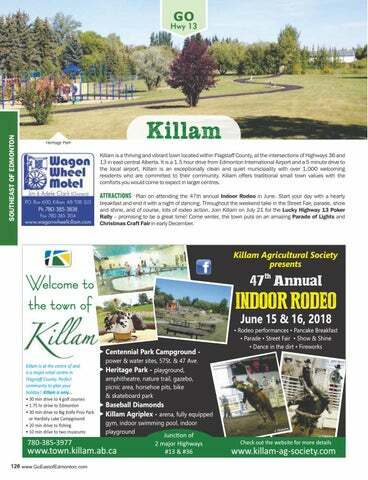 Killam offers traditional small town values with the comforts you would come to expect in larger centres. ATTRACTIONS Plan on attending the 47th annual Indoor Rodeo in June. Start your day with a hearty breakfast and end it with a night of dancing. Throughout the weekend take in the Street Fair, parade, show and shine, and of course, lots of rodeo action. Join Killam on July 21 for the Lucky Highway 13 Poker Rally – promising to be a great time! Come winter, the town puts on an amazing Parade of Lights and Christmas Craft Fair in early December.